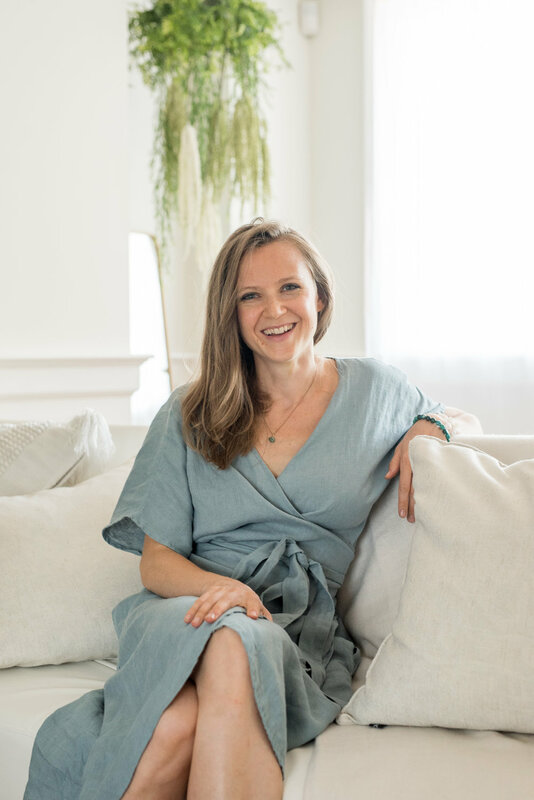 I’m a GentleBirth childbirth instructor, a nutrition and healthy lifestyle coach, yoga teacher, and the founder of Moonlight Motherhood--a healthy lifestyle company. I apply evidence-based health and well-being practices and training in yoga, eating psychology, and mind-body nutrition to help you find and sustain a vibrant sense of well-being in your daily life as a mama or mama-to-be. We have been programmed to be in constant motion. Our minds jump from one thought to the next. We have short attention spans. And we all too rarely give ourselves permission to simply stop and be present. Why is this important? Because only when we're quiet, and when we slow down, and tune in, can we feel and acknowledge the subtle signs of our bodies, hear our intuition, and act on our impulses that seemingly come out of the blue, but are actually guidance from within our deepest selves. When we nourish ourselves through wholesome foods, pleasurable activities, and positive thoughts, we thrive. This is what I help you uncover whether you’re preparing for your baby’s birth, or finding a supportive and uplifting rhythm as a mama. Whether through yoga or coaching or both I guide you through the process of uncovering how your beliefs, situations from the past, or current circumstances are affecting your relationship with food and body. This unraveling creates room for acceptance and a new path toward an embodied sense of well-being that permeates all areas of your life. Ever since I can remember I've been seeking freedom. Freedom from limiting beliefs that prevent me from living the life of my dreams; from stress; from food issues; from fear; from a fixed mindset. More profoundly, I seek the freedom to live in a way that aligns with my own purpose, and the freedom to constantly evolve, trusting in the journey and all of its ups and downs. In 2008, I discovered the gift of teaching yoga which was the seed that inspired me to guide others in their journey to abundant health and well-being. I pursued my yoga teacher training in 2010, and as I continued to practice and teach, the physical practice of yoga evolved into a mental and spiritual one, as well. The more I learned about the body and mind, the hungrier I was for more knowledge and wisdom and a peaceful inner experience. The food component of my yoga teacher training illuminated the power of food on the body and mind. I will never forget my teacher, with a basket of squashes, rutabagas, and carrots, saying, "These foods saved my life." This statement had a profound affect on me and so I began to explore my relationship with food which has radically changed how I eat, and which led me to pursue getting certified as a mind body eating coach. In 2017, I fell in love with all things birth and motherhood when I had my son and began to tie all my training together. My birth experience inspired such a profound shift in my own power and strength that I felt compelled to better understand it and be a part in helping other women have just as positive an experience. I chose to be trained in the GentleBirth method because it offers the most up-to-date science around understanding birth physiology, gives expectant moms an evidence-based toolkit of comfort measures. The GentleBirth method also prepares women and their partners for birthing using brain training techniques, including mindfulness, sports psychology, and cognitive behavioral therapy, all of which when practiced can be applied beyond birth, helping you as a parent! In the end, how could we possibly be awake to the beauty of our lives, how can we perform in our careers, and be present at home if we lack energy and our body, mind and spirit aren't balanced? This is what I help you do. I received childbirth education certification through GentleBirth, my yoga teacher certification at West Hartford Yoga in Connecticut with Barbara Ruzansky, and my Dynamic Eating Psychology and Mind-Body Nutrition Certificate through the Institute for the Psychology of Eating.